It's been a while since the old school tech nerds had a discussion. I'm curious as to what circuit deviations of OR-120/OR-80 amps are out there and not accounted for in the available schematics. I've put together a spreadsheet of the different circuits, and only listed the pertinent components that differ between the different iterations. See the attached spreadsheet. 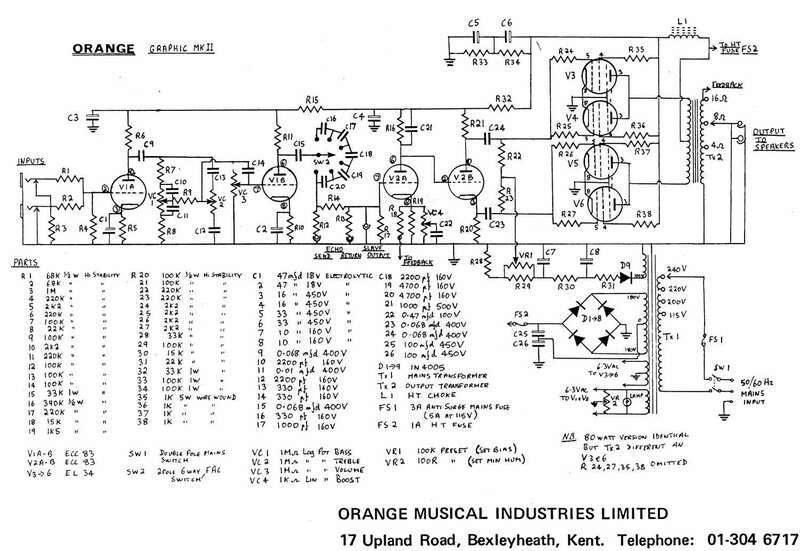 If you have a 70's amp and can poke around and verify component values, it would be great to get a list of serial numbers (and/or build dates) and reference how consistent they are with these schematics. Sent me the info, or download the spreadsheet and update it with your info. If you have a 90's amp...see if it's consistent with mine. I believe they are all the same, but it would be interesting to know. 4) 1990s reference amp - Overdrive 80, S/N 941. Believed to be 1996 build date. 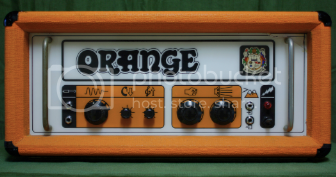 5) "Orange OTR120 amp" dated September 23rd, 1998. I have messed around with these different circuit iterations over the years. There is a definite difference in sound. It's a little involved to discuss the differences in an opening post, but if anyone is curious to talk about that stuff, I'm game for sure. The '72 and '74 have the same tone stack. The post '74, 90's reissue, and OTR are all unique. Though the component values are very similar. The differences are really in the treble circuit and how that reacts. It's a notable difference if you roll the treble knob over halfway. The '72 circuit is unique, and they changed things after that. The '74, post '74 and 90's reissue are all the same (direct coupled). The OTR is basically a modified '72 style. The plate and cathode resistors are different (that amp runs different voltage droppers, which is likely related to these changes). Again, the '72 is unique in that is has an inductor in series with the cap. The The '74, post '74 and 90's reissue are all the same. The OTR is unique to itself in that the feedback loop resistor value is higher than all the others (pot and cap are the same). For filtering, the 70's amps are all the same. The 90's reissue has more filtering in the late (pre-amp) stages. The OTR has the extra filtering found in the 90's reissue, but it also has different value voltage dropping resistors. The 70's amps have some notable differences between each other. The 90's reissue amp is nearly identical to the post 74 schematic, but with one cap different in the tone stack, and with higher filtering in at the end of the B+ rail. The OTR takes aspects of most of these circuits, but seems to pay homage to the '72 and deviate where Ade wanted to add his own flavor. The OTR is the one circuit I haven't played around with, so I can't offer any insight on how those changes sound when implemented in a given amp.